It's becoming a familiar thing now that we spend our Wednesday evenings until quite late looking up in dictionaries the precise words to best describe the mysteries of our art practice, grooming pictures in Photoshop and so on, to bring this weekly Update to life. We have been certainly busy in the studio this past week, throwing our minds and hearts into the new works for our next month's Berlin show. Yesterday we started recording a video as a kind of an experiment. The video shows us both working together on two paintings: taking turns to paint colourful horizontal stripes on two bare canvases, from top to bottom. Each stripe is made in response to the previous one, that has just been painted by the other person. In this way, we end up in the video with a series of conversations. On one level, the obvious physical conversation that happens between us while we are making the pictures; and on another level the works become a sort of a conversation in themselves, as each stripe carries a certain mood, created by the colour, width, nuances of texture and particular kind of effort by which it is applied. We hope to have the video ready to show you soon. One could say our paintings come on their own accord, and we just keep on finding out through the process what our joint work is all about. The paintings themselves reveal to us why we do what we do. 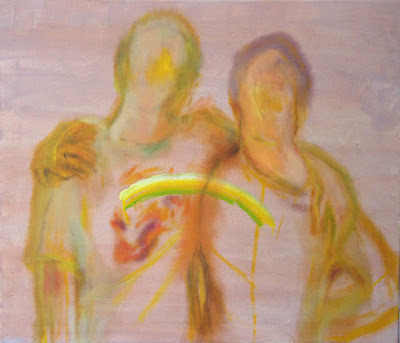 In the case of the painting in progress of the two fellows below, a sense of celebration of human connection and friendship is wanting to crop up. In the making of a painting like this, we can see that the stuff that sustains, binds and moves our joint art practice -and that we hold so dearly- is finding its way into the work.